No sign of Ollie North on Playa Madera. Nicaragua is one of those destinations that tends to get a “You’re going where?” any time you mention your travel plans. Despite the fact that Nicaragua’s notorious civil war ended a generation ago, its name remains stubbornly connected to violence and Regan-era scandal. Which is truly undeserved and a darn shame. It’s got tropical beaches. It’s got volcanos. It’s got friendly people. It’s only two-and-a-half hours from the US. And a trip here costs a fraction of the price of a vacation in neighboring Costa Rica. On our recent trip, we ate, drank, and did anything we fancied and the final cost was… not that bad. Nicaragua still sees more tourists with backpacks than suitcases, but that doesn’t mean you’ll be sleeping in hostels and eating your meals sitting on a curb. There are plenty of upscale hotels and refined dining options—most of them so inexpensive that you can opt for upgrades and order lobster with unbridled abandon. And you won’t be the only ones bringing your kids there. Seriously. We met other vacationing families every place we went. And the hotels and restaurants were ready to receive us, pink kitty suitcases and all. To market, to market in Granada. So how rustic is it? You get a good flavor for Nicaragua by taking a spin down its stretch of the Pan-American Highway. Its two lanes comprise one of Nicaragua’s few paved roads and bear everything from old American school buses whizzing to market with produce and passengers on the roof, to sleek new Mercedes sedans, to ox carts loaded with two stories of hay. Chickens literally cross the road (our preschooler was beside herself at that one), along with cows, pigs, and dogs. Along the margins, street vendors roast fabulous-smelling meats on giant wok-like skillets. 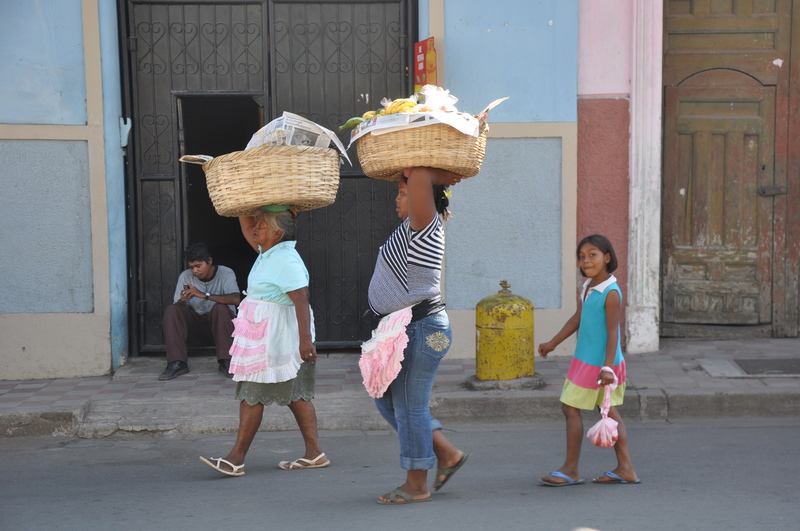 Women in frilly aprons stroll by with enormous baskets of bread balanced on their heads. Howler monkeys swing from the trees. The daily grind seems like a carnival—all at once wholesome, frenetic, pastoral, and gritty. Anja falls under the spell of Hotel con Corazon's tranquil courtyard. While you’ll land in Nicaragua’s largest city, Managua, there is little to see and no reason to dillydally. Granada, just an hour south of the airport, has far more to recommend. Founded way back in 1524, Granada maintains a rather down-at-the-heel colonial charm. A cathedral-flanked central park is always abuzz, a looming (but gentle) volcano owns the horizon, and its ramshackle side streets echo with hoofbeats mingled with the buzz of motorcycles. The center of the city is easily walkable and always interesting—I wouldn’t so much as run an errand without bringing our camera. 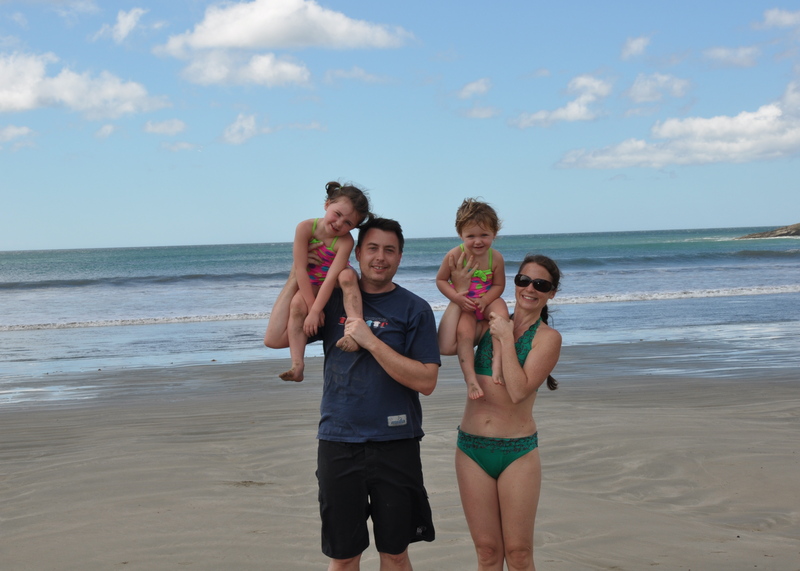 Our family stayed at the commendable and kid-friendly Hotel con Corazon. Its name translates into “hotel with heart”—and with good reason. The hotel is a non-profit operation that supports the local community with an emphasis on education and responsible tourism. Just because Hotel con Corazon is a hotel with a mission doesn’t mean trading altruism for comfort. The hotel is so clean, cozy, and well run that you’d forget that you were staying at a non-profit foundation, were it not for its prevailing warm and fuzzy vibe. The rooms have a Scandinavian sensibility, with clean lines, minimal furnishings, and walls adorned with photographs taken by Nicaraguan youngsters. In the main quad, you can linger over a cheerful breakfast or check your email from a hammock in the hotel’s lush garden. Or have their warm, English-speaking staff arrange a day trip for you through one of their various community partnerships. Along with all the usual Granada sightseeing tours, Hotel con Corazon also offers activities especially for families, including piñata-making workshops, lake fishing expeditions, or cross-cultural play dates with Granadan kids. Hotel con Corazon’s nightly rates range from US$63 for a low-season double, to $116 for a high-season two-room family suite (with travel crib, if you ask). Breakfast is included. Nothing says adventure like having to park your car in a manner that allows you to make a quick getaway. Volcán Masaya. To Hell and back in a (lovely) day. If you are short on time, you can cram three of Granada’s most popular day trips into a single ambitious day. Begin with the very much active Masaya Volcano, next make an afternoon stop in Masaya’s renowned market, then end the day with a late afternoon cruise on massive Lake Nicaragua. A short drive outside the city, Masaya is a must-see hell mouth of sulfurous steam. Unsuccessfully exorcised by Spanish missionaries who thought they’d found the gate to the underworld, Masaya has been active enough to hurl boulders at sightseers as recently as 2001. Hilariously dire reminders to park your car facing the exit and dive under your vehicle if the volcano starts acting up add a note of adventure to an otherwise easy outing. 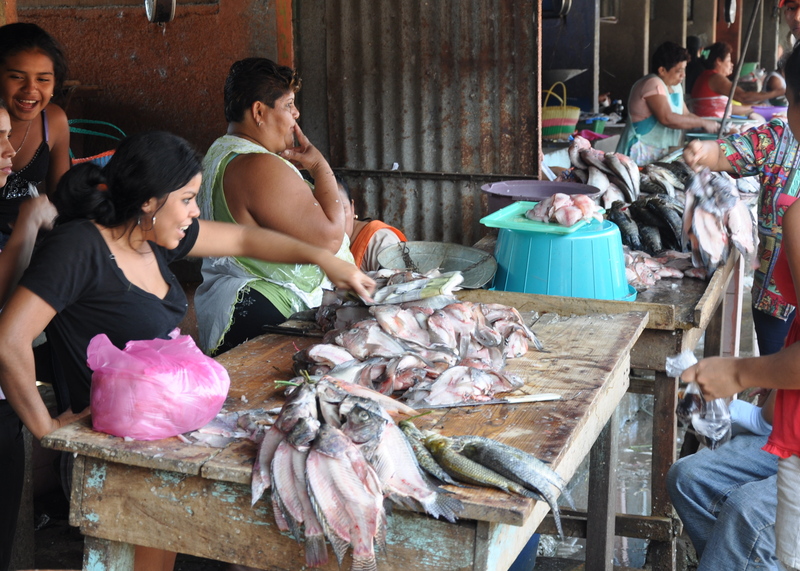 Fishwives in Masaya's New Market. Safely downslope from the cone of Volcán Masaya is the village that shares its name. Widely renowned for having the biggest and best craft shopping in Central America, the double markets of Masaya would take days to thoroughly explore. No mere tourist show, Masaya’s New Market is a sprawling labyrinth of stalls selling everything from shoes to squid. If you’re short on time (or olfactory fortitude—the meat district smells just as you’d expect piles of offal in the tropical sun to smell), the nearby Old Market caters directly to tourists. Its celebrated collection of dealers and artisans offer such Nicaraguan staples as handcrafted hammocks (a must-have souvenir), traditional pottery, soapstone sculptures, and a variety of textiles and woodcrafts. Crossing the street, isleta style. 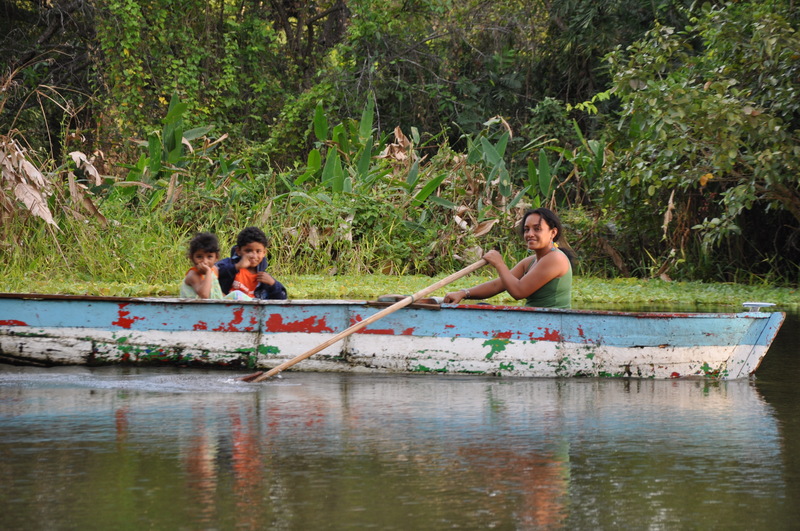 Residents of Lake Nicaragua's community of tiny islets routinely scoot from island to island in row boats. Back in Granada, board a safe and stable panga boat (with kid-size life jackets) for a cruise around Lake Nicaragua’s unique community of isletas. Late afternoon is a great time to explore the lake. With the heat of the day abating, the hundreds of tiny islets go through an intriguing sunset bustle. Dozens of residents hop from island to island in row boats or pull nets from the Lake Nicaragua’s depths. Thousands of roosting lake birds fill the trees as the sun sets vividly between Mombacho Volcano and Granada’s cathedral-dotted skyline. After spending the morning touring the farm, there's nothing like finding the farmer's wife awaiting you with a hot lunch. Meeting my beloved coffee at its source. Masaya’s sister volcano, Mombacho, can be thanked for the isletas’ existence. It was a massive explosion ages ago that jetted about a third of Masaya into the lake. Today Mombacho is calm and forested, with only a few fumeroles to remind you that it is dormant, but not extinct. Hotel con Corazon arranged a guided visit to Mombacho and the slope-side village of San Pancho. In San Pancho, a local farmer named Don Julio walked us through the village’s shade-grown coffee plantation and croplands as our guide described the strict logging rules and conscientious farming practices that make these farms look like forests. We nibbled coffee berries, gathered produce, and watched howler monkeys swing through the passionately protected canopy. Frank Luna, our amiable guide, leads us along the dormant caldera of Volcán Mombacho. All our ambling finally led us past a dozen or so simple and dusty homesteads to Don Julio’s own home, where the doña of the the house prepared a wholesome meal completely from food gathered from their farm. And let me tell you, the doña could cook! 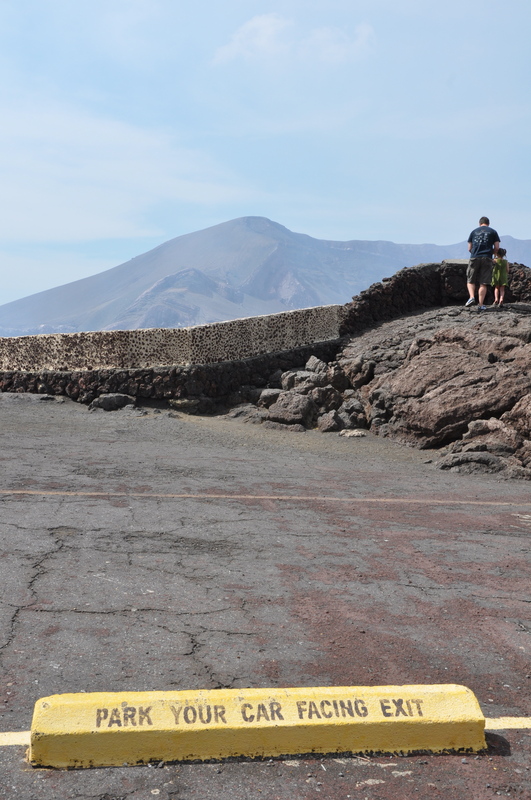 After lunch, we rolled ourselves onto a military-weight truck and drove toward the summit of the volcano. Slightly upslope, a quick stop at Cafe las Flores showed how coffee berries become the beans we know and love. The small factory shop offered sample brew and bags of beans at a bargain (US$4 a pound!). 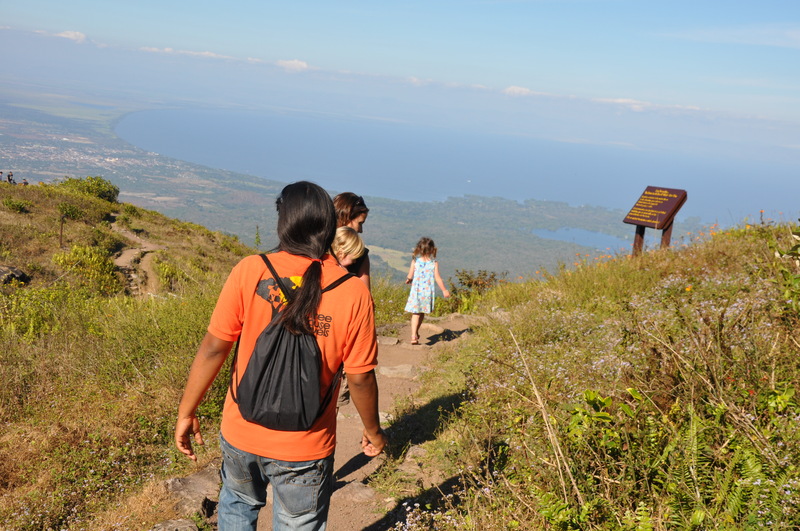 Further up the steep and switch-backed road, the summit of Mombacho has some great hikes around the extinct caldera. In about an hour, you can hike through a lush forest paradise full of birds, scads of butterflies, and trees laden with dozens of species of wild orchids. Beyond the forest are unrivaled views of the lake and isletas, tiny Granada, and a half-dozen other volcanos in the region’s chain. On a clear day, views sprawl as far as the Pacific Ocean. If only every restaurant in the world had a hammock to keep the kiddos occupied. Back in Granada, we squeezed in the requisite (especially if you have a four-year-old girl traveling with you) horse-drawn carriage ride around the city. We didn’t insist on an English-speaking driver (a luxury that will bring the cost of the one-hour tour from about US$10 to US$15), which meant many of the city’s landmarks were lost on us. In hindsight, it is worth the effort to ask along the ever-present row of carriage drivers around the central Parque Colon to find one who can provide commentary along with quaintness. Eating and drinking in Granada is inexpensive and laden with delicacies. 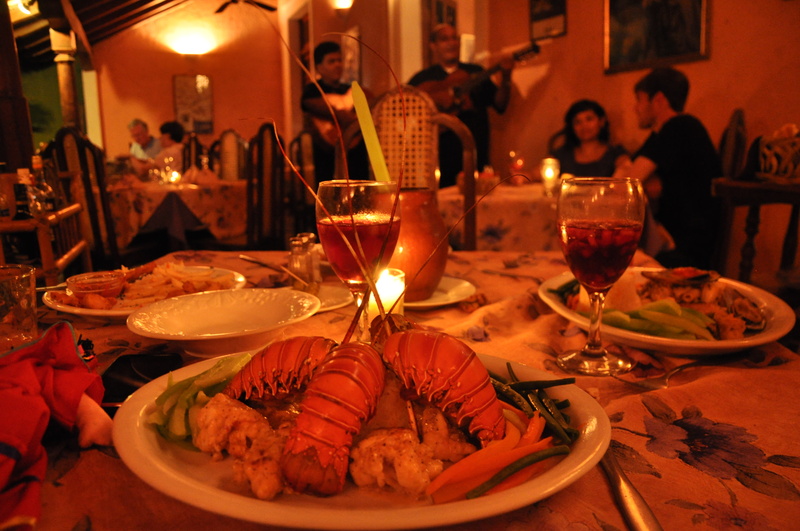 Seafood figures prominently on Granadan menus, including fish, lobster, and shrimp harvested both from the nearby ocean and the lake itself. Sangria is the local tipple, and Flor de Caña rum is the boast. Make a small splurge and try the brand’s premium 18-year variety, a rum so smooth and mellow that it can be sipped like cognac. We dined one night on the sidewalk of the touristy Calle de Calzada and regretted it. While the carnival atmosphere of street performers and musicians is entertaining, the incessant table-side onslaught of street vendors, performers seeking tips, and bold beggars become a nuisance. Instead, opt for one of the city’s many better restaurants with courtyard gardens. Loaded with colonial charm, these places offer the delight of dining al fresco with the quietude of a private garden. Even better, all had at least one hammock; a blessing for anyone dining with small kids. With room to run and play for our daughters, we could actually order multiple courses—and even a digestif. Incredible food. Great live music. Dining al fresco. Warm service. Very reasonable prices. And a play house. I believe that I have found my dream restaurant in El Zaguán. By all accounts, Granada’s most acclaimed restaurant is El Zaguán. Our guidebook advised us to follow our noses to it meat-laden grill, and their instructions were perfect. It looks like nothing from the street, but inside it’s a refined fiesta with fine dining, vivacious live music, and a grill you will photograph and brag about like it’s one of your children. The food and service at El Zaguán lived up to the hype. My husband’s steak elicited a, “Wow. Just wow”, on the first bite. I was looking forward to their famed whole-fried fish known as pescado a la tititapa. But the waiter warned me that the smallest guapote fish they had that night was large enough to feed at least three. Since news of my competitive-eating-caliber appetite clearly hasn’t reached these parts, I let him steer me toward sea bass steamed in ginger. And he was right: I was very happy. For the girls, a cordially divided adult portion of fried fish fingers made for the freshest, most gourmet fish sticks we’ve ever come across. I’d be remiss not to mention one of El Zaguán’s biggest draws for anyone eating out with young kids. 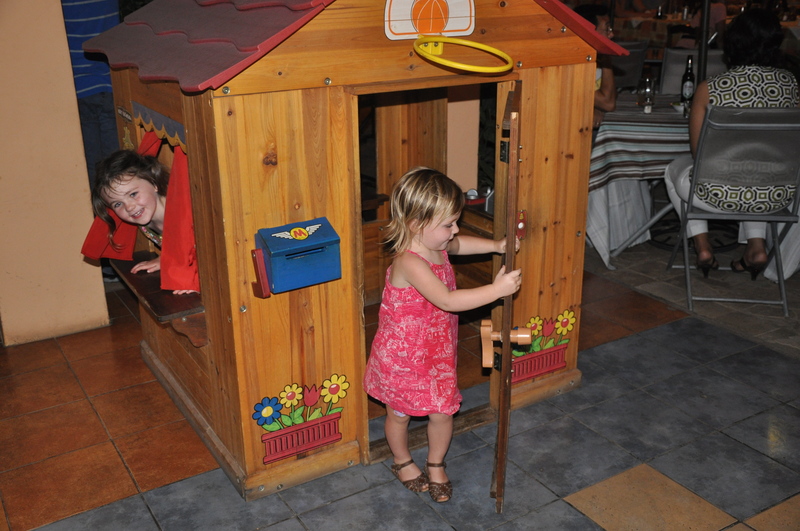 Just a few feet from our table, a quaint wooden playhouse beckoned kids to be kids. Thanks to the volume of the live music and the open-air digs, they were able to play so vigorously that we could scarcely keep them at the table long enough to scarf down a few of the aforementioned fish sticks. El Zaguán is located on the road behind the cathedral—these directions will make sense when you get there. Entrees average about US$12. An equally fabulous dinner was had at Mediterraneo. This is certainly one of Granada’s most upscale and expensive restaurants (I think we cracked US$80 when all was said and done, but we ordered multiple courses… and rounds). Set in a formal garden with floral table clothes, roving musicians, and charismatic waiters, it was a date night place if ever there was one. Fortunately, it still had a hammock and grass to sprawl on, so the girls stayed busy without causing a ruckus. We ordered their signature mixed seafood grill and a lobster tail special. The portions provided a glut of smashingly seasoned fish, prawns, and shellfish. Andrew’s lobster portion was so large that he had to enlist my help in finishing it—no easy task, since I’d already downed most my own enormous entree. But seriously, what kind of maniac leaves lobster uneaten? Mediterraneo, Calle Caimito. Entrees average around US$12. The Garden Cafe. Now isn't that just lovely? We had a standout lunch at the Garden Cafe. The beauty of the cafe’s eponymous garden can not be overstated. 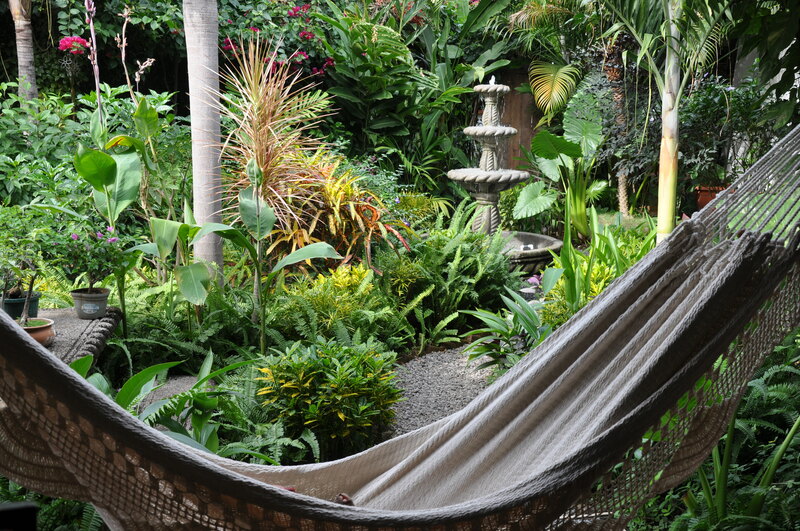 Lush, tropical, and white hammock ringed, it’s an oasis from the hot and dusty midday streets. Exotic birds flitted in and out of a trickling fountain as we sipped glass after glass of homemade lemonade and dined on fresh and healthy sandwiches. I’m definitely adding it to my list of happy places. Garden Cafe, Enitel, 1 c al lago. Lunch with fresh juice costs about US$6 per person. Open for breakfast and lunch only. Anja and Ingrid fall in with Mango Rosa's surfer crowd. Surf instructor Johnny is the blond dude on the left. Nicaragua has 565 miles of tropical coast, and not a single Tony Roma’s. Or a Senor Frog’s. Or a Club Med. Or a Ritz Carlton. Most roads are unpaved. The beaches don’t have cabana boys. And words like “luxury” refer to amenities like private bathrooms. It’s rustic in a cabin-on-the-lake kind of way, so you must be prepared to endure small discomforts like fluctuating water temperature in the shower (and no tubs), dusty dirt roads anyplace you’re going, and roosters and howler monkeys awakening you at first light. But on the plus side, the beaches aren’t crowded, you don’t feel like you’re in a tourist Potemkin village, and roosters and howler monkeys awaken you at first light. The Pacific coast around San Juan del Sur is an easy two-and-a-half hour drive from Granada (paved roads, baby!) and offers a good balance of infrastructure, wild nature, and authenticity. This region is legendary in surfing circles and the surfers definitely own the tourist vibe. 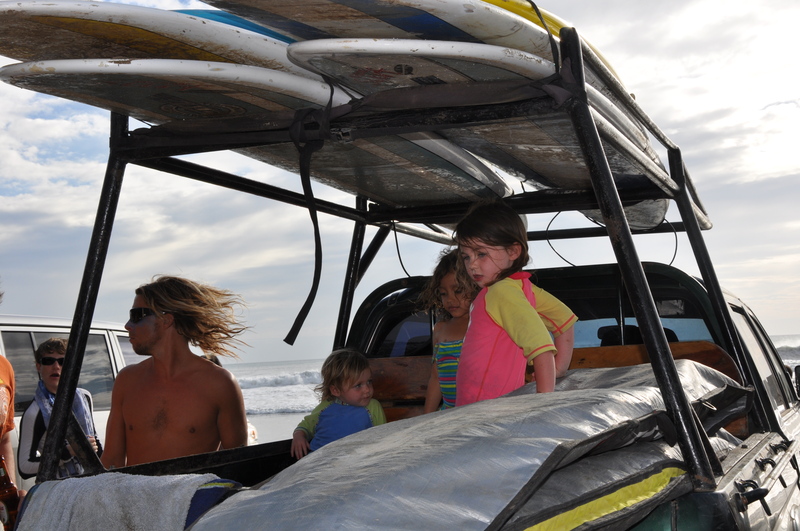 Since surfers don’t seem to mind where they sleep, so long as there are waves and cold beer nearby, many accommodations are little more than a bunk on the beach and not suitable for families with small kids. But a handful of family-friendly resorts are popping up, offering clean, secure rooms, on-site restaurants, and fun-for-kids things like swimming pools. Once such resort is the countryside compound of Mango Rosa. Ironically, this surf resort is not actually all that near the beach, but don’t let that dissuade you. Instead, it is a trim village of thatched ranchos and tidy bungalows largely hidden in the tropical jungle. Its nearest neighbors on all sides are farms; and it is commonplace to see livestock grazing alongside the dirt road that leads from town past the hotel. Follow the cows for another kilometer or so and the road dead ends in the sand on one of the neighborhood’s two gorgeous beaches. San Juan del Sur itself was a 15-minute drive away, and a great place to restock, make an emergency bathing suit purchase (yes, we actually forgot to pack my husband’s trunks), or have a seaside meal. That said, it is hardly a destination in and of itself and can be missed without much regret. Instead, Mango Rosa has a way of meeting your every need, so the days slip by with little effort or worry. Mango Rosa's cozy bungalows are plenty roomy enough for a young family. Mango Rosa’s accommodations range from a grand three-bedroom villa, to simple one-bedroom bungalows. I can attest first-hand that the one-bedrooms can easily accomodate a young family. Spacious and sparklingly clean, our little cottage came with a well-equipped kitchen, a decent-sized living room with cable TV (with Nick Jr. in Spanish), and a bedroom roomy enough to accommodate a twin mattress at the foot of our bed, where our daughters slept soundly each night. Good food is easy to come by, both at the resort’s soaring open-air rancho bar and a smattering of local seaside cafes. Don’t miss the taco stand on the nearby surf beach of Playa Madera. Trusty and delicious, this little shack serves up fresh fish tacos and nachos to die for, along with frosty cans of Toña (the local brew), fresh juice, and bottled water. I didn’t have high hopes for my surfing abilities. I’m not what you’d call “graceful” or “coordinated” or “not humiliatingly clumsy.” But since Mango Rosa was ready with board rentals, beach transport, and a perpetually shirtless surf instructor named Johnny, a surf lesson just seemed to naturally follow. Believe me: nobody was more surprised than me when he had us riding the waves within minutes of our hour-long lesson. With nearly two years of expat living under his belt, Johnny is also a ready tour organizer who knows the countryside’s rollicking backroads like the back of his suntanned hand. I may not be quite a surfing legend, but thanks to a great lesson or two from Mango Rosa's surf instructor, I got to ride some of Nicaragua's legendary surf. Zip-lining through the canopy with a trusty guide. Yes, we were all humming the "Go, Diego, Go!" theme. Flying preschoolers and baby sea turtles. While our daughters would be more than happy to play in the sand until the sun goes down (it crossed our minds that they might have gotten the same vacation experience in a sandbox), we do try to get some non-bathing suit fun in once in a while. 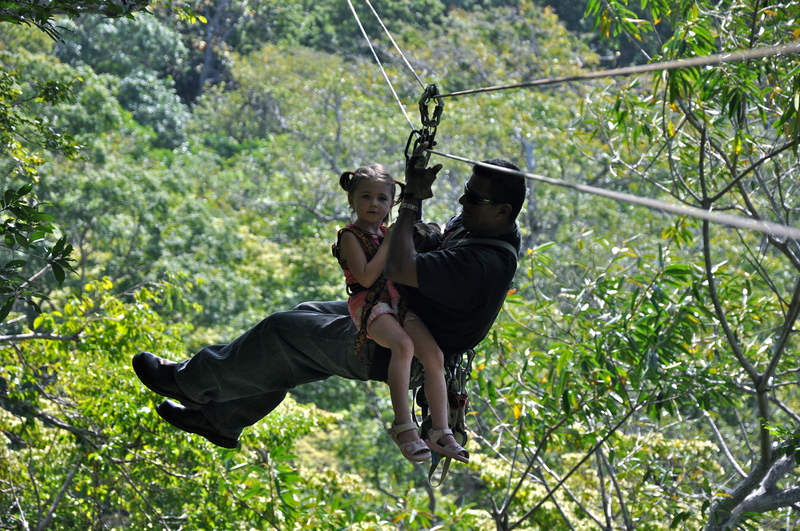 Mango Rosa can arrange horseback riding (ages 5 and up) and zip-lining (ages 3 and up). If images of a three-year-old careening out of control down a zip-line are terrifying you, rest assured that little kids ride along with a guide and that the zip-lining itself is a pretty lite adventure. Nighttime sea turtle viewing is a must for any family. While the cost (US$50 per person) is high by Nicaraguan standards, and the ride out to the beach is a bone-jarring hour on a route that is more potholes than road, it is so incredible that you’ll scarcely believe that it’s happening in front of you and not on TV. The destination is the carefully protected preserve of La Flor, located just a kilometer from the Costa Rican border. Here, 30,000 female Olive Ridley turtles return each season to the very sand from which they scrabbled forth about fifteen years earlier. They haul themselves up on the beach, dig a nest, lay their eggs, then push on back to sea. About two months later, thousands of downright adorable baby sea turtles erupt from the sand and skedaddle to the ocean beneath an inky sky of a million stars. He was right. In mere minutes, a depression in the sand became a writing pile of cuteness, as dozens of hatchlings clumsily smacked each other with their outsized flippers. Once they got their bearings, each scampered off to the ocean, leaving a sweet path of wee flipper tracks. An added treat for our four-year-old (Who am I kidding? For all of us!) was getting to release a baby sea turtle ourselves. Since nests that hatch during the day don’t stand a chance of making it to the water before a host of predators gobble them up, the researchers gather the hatchlings and hold them in baskets until evening. Kneeling in the sand, we each got to pick up a flailing little turtle, whisper good luck, and set it in the sand on the water’s edge. 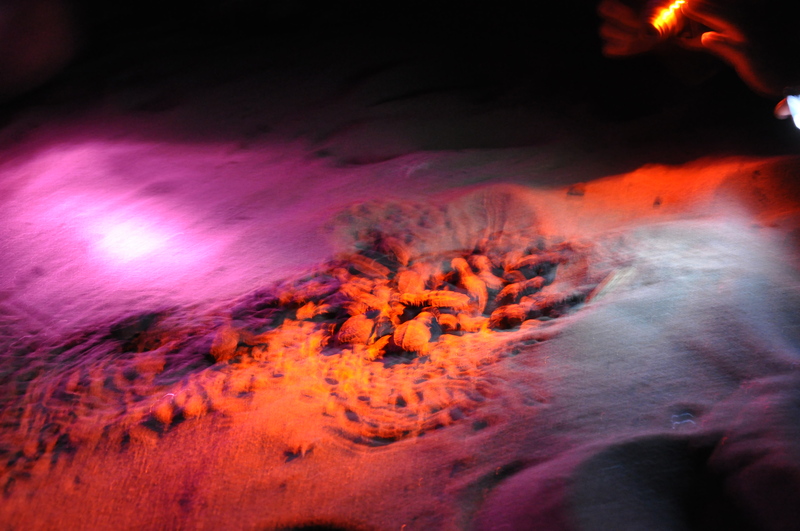 Forgive the horrid photo quality, but we didn't want to bother the newborn sea turtles with flash photography. Anyway, here they are emerging from their nest. Anja named her turtle Lucy and wished her buena suerte. We mused about Anja and her hatchling reuniting on La Flor when they’re both grown up. 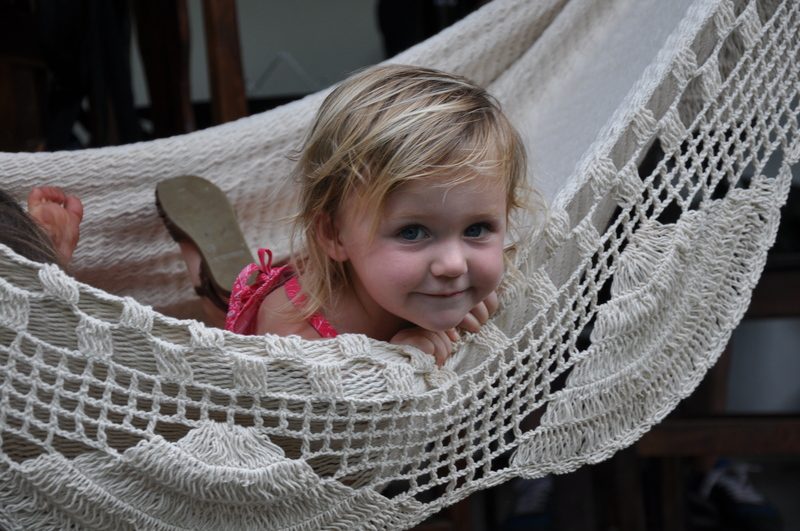 And in true Globe-toddling style, we hope Anja’s own children can welcome Lucy’s grandchildren into the world someday on that distant beach in our now-beloved Nicaragua. A one-bedroom bungalow at Mango Rosa is US$95 a night in low season, or $139 a night during the Christmas and Easter holidays. 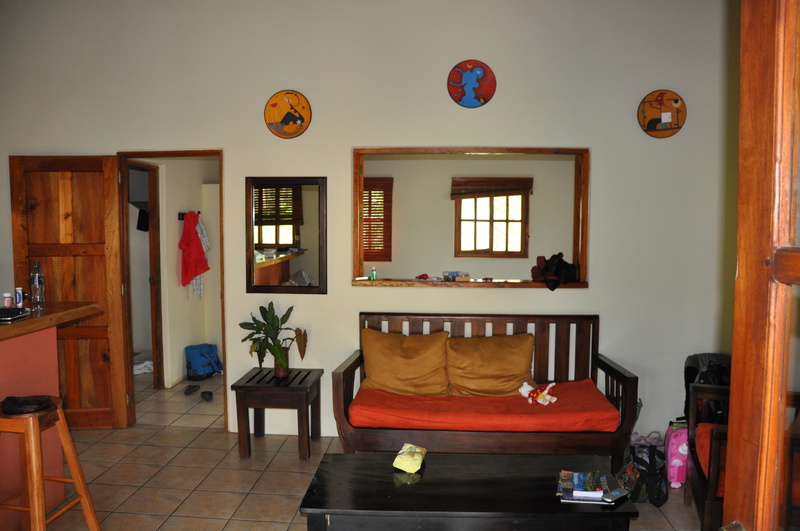 A three-bedroom villa rents for US$220 a night in low season, or US$300 in high season. Zip lining on an 18-platform course is about US$35 per person. 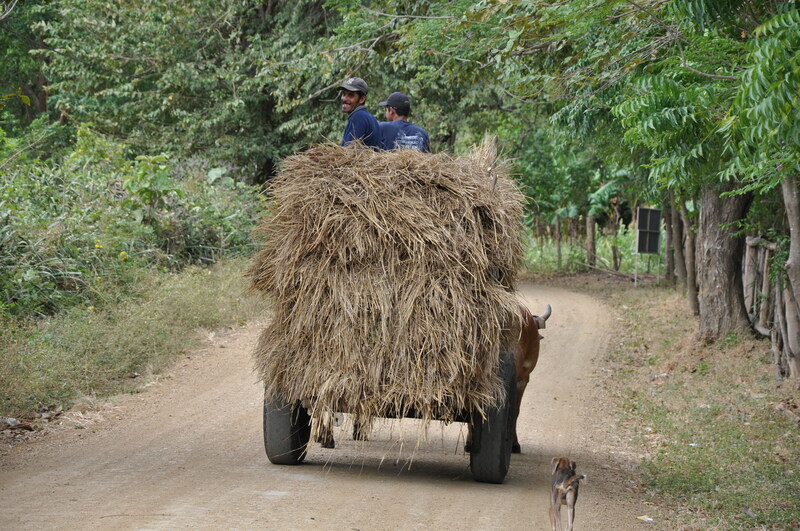 The simple life in the countryside outside San Juan del Sur. Getting there: Nicaragua can be reached by a very manageable two-and-half-hour flight from Miami. Several US carriers offer daily flights out of Miami, as well as Fort Lauderdale, Atlanta, or Houston. Getting around: Expect to pay around US$34-45 for a trip from the airport to Granada, and US$70-80 for the two-and-half-hour ride to San Juan del Sur. A cab from Mango Rosa into the town of San Juan is US$15 each way. A note on safety: It is difficult, but not impossible, to find cabs with seat belts. Our family struck a balance by insisting on them for long-haul trips, but crossing our fingers for shorter journeys. If you want a car with seat belts, ask ahead—it may take your hotel a bit of calling around to arrange your ride. Granada and San Juan del Sur’s crime is mostly of the petty variety. Conduct yourself as you would in any larger city and you should be OK. As with any destination, use commonsense and keep a low profile. For more information, visit the US State Department’s tourist info page for Nicaragua. A note on health: Nicaragua, like most of the developing world, requires a bit of traveler’s care and caution when eating and drinking. Many restaurants catering to tourists use purified water to prepare food and drinks. Be sure to ask before you order. Also, be sure to visit the CDC’s website for Nicaragua-specific guidance. Then line up a pre-trip visit with a travel clinic or your regular doctor’s office to discuss health precautions. A note on poverty: While Nicaragua is one of the Western Hemisphere’s poorest countries, the track described here is part of the nation’s more prosperous swath. Expect life here to be far simpler (most farms can be described as “living off the grid”), but not alarmingly destitute. Globe-toddling always promotes responsible tourism, and we encourage you to give back to the communities you visit by purchasing from local artisans at fair prices, patronizing local businesses, and supporting community initiatives. Hotel con Corazon was an enormous help to us in adding a humanitarian element to our vacation. Just ask them about ways to help when you book. We ended up bringing two extra suitcases full of clothes and supplies… and bringing them back full of souvenirs! Very good report. Enjoyed reading and glad you had a good time. 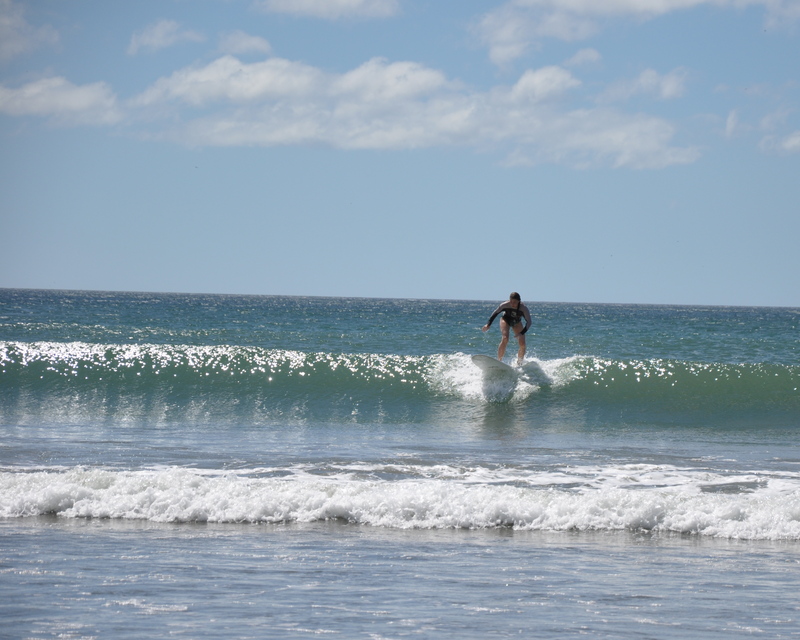 Sorry you could not have spent more time in San Juan del Sur and not just on the surf beach. The joy of our little town is the people and how they embrace and welcome you. The kids would have loved the park at http://www.parkavenuevillas.com and the courtyard pool at the hotel. With the best view of the harbor and sunsets it is known as the best VALUE in town. Next time you are friends come our way please stop by and say howdy. I look forward to reading more about your family’s adventures! Great read! 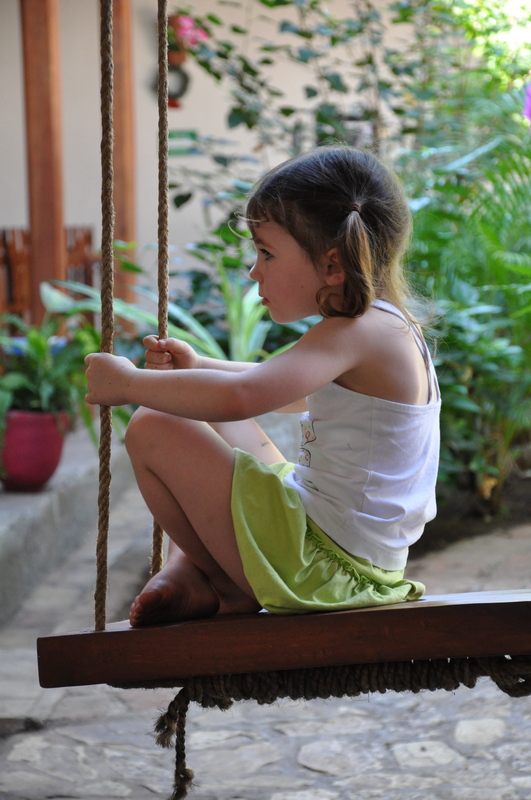 We are traveling to Nicaragua this spring and are taking two kids as well so your article really hit home. I mean, how many articles are out there about traveling to Central America with two little ones? It’s great to hear that you all had such a fun and safe journey. We’re actually staying in San Juan del Sur at the Park Avenue Villas. Can’t wait!!! other (public transportation?) or did you rent a car? Thanks for the well written report — can’t wait to go! Thanks for the kind words and so glad to hear that you’re a kindred family traveler. Skipping Ometepe was an agonizing decision and was solely based on time constraints. Missing it seemed like such a crime, but we just couldn’t make it work without changing hotels four times in eleven days, so we decided to save it for next time. Seeing the twin volcanoes from the road between Rivas and Granada made us long to visit it all the more. If you decide to go, please let us know what you thought. All that said, we did agree that the next time we’re there, it might be fun to rent a 4WD and have the freedom to tool around wherever we wish. There are definitely advantages and disadvantages to both options. Hope Nicaragua is as magical for you as it was for us. I really was excited to find your blog. I have been to Nicaragua two times about 12 and 7 years ago. I hadn’t considered it a family vacation spot until I read your blog. I used to stay in $5 dollar accommodations. Even though i am a surfer i have stayed away from surf resorts opting for cheaper digs. Did you find the bar/restuarant to be play bass thumping music into the night? I like quieter places, but it does seem pretty convenient. We have a 11 month old to try to put to sleep and we like to sleep too. Do you have any other recommendations for lodging in that beach area? Thank you. Mango Rosa was very conscientious about the noise level in the bar, especially since it is open air and they know people are trying to sleep at night. We were never bothered by it inside our bungalow, even though we were the nearest house to the bar. There was one night when we were sitting on the porch when we chuckled that they were really partying that night, but it was not loud to the point of being a nuisance (no thumping bass) and it didn’t disturb us in the slightest once we were indoors -and we even had the windows open. Hi I just read through your whole post…very interesting, even though I don’t have kids. I love unspoiled places like this, where everything isn’t sanitized and made by the government. Sounds like you had a wonderful trip! I am considering a 10-day visit with a 3 year old in December/January. Can you give me an idea of how many days you feel should be spent in each of the cities/areas you visited to truly capture all that each has to offer? Thank you in advance, and thank you for sharing the details of your trip! I’d give Granada at least two full days. The beach… well, we could easily spend a month there! If you’re looking for a relaxed pace to your trip, perhaps give San Juan del Sur the better part of a week. If you don’t mind picking up and moving a bit more, then add a night or two on the island of Ometepe. We opted for a slow-paced trip, so we skipped Ometepe with much regret -by all accounts, it is heavenly! Such a great trip report, thank you! My husband and I leave August 26 for 2 weeks in Nicaragua with our 4 year old, Sophie. She’s so excited! We hope to visit Granada, San Juan del Sur and Omotepe. A few questions. Would you recommend bringing a bigger, more off-road type stroller or a smaller, folding travel one? Sophie will walk a bit but gets tired quickly and won’t ride in a backpack carrier. I’m wondering about even short hikes or walks on dirt roads, cobblestones even in Granada. Also, did you take anti-malarial meds and typhoid vaccines for you and the kids? Don’t think we’ll rent a car, we’ll do the cab with car seat route–thanks for advice about seatbelts. Did you ever do a shuttle? Also, did you have any problems finding child-sized life jackets? Thanks again and love your blog and congrats on the new babe! Stroller: Tough call. Trouble is, you’d be better served by an off-road/jogging stroller on the unpaved country roads of SJDS and Ometepe, but would have a hard time navigating the narrow sidewalks of Granada with one. But Granada is also full of cobblestones, curbs that practically require climbing gear, seriously perilous potholes, and tiny shops and cafes that are definitely not stroller-accessible -and I’m not sure how well you’d fare with an umbrella stroller under those conditions. That said, you do see some strollers in Granada -it would just be tough sledding with one. On balance, I’d probably go with the umbrella stroller, just because it would be easier to haul around -especially if road conditions render it useless for a stretch. As far as hiking trails go, any that we were on were way too narrow and rustic for a stroller to be of any use. Definitely a feet-only type of terrain. Vaccines: We visited a travel doctor and decided to say yes to the typhoid vaccine and no to the anti-malarials (because none of the places we were going were in malaria red zones). I would definitely recommend visiting a travel clinic or your usual doctor to make sure you have the vaccines you need before you go. And I highly, highly recommend bringing a ziplock bag full of just-in-case medications: pain killers, broad spectrum antibiotics (your doctor can prescribe these), anti-diarrheals (for grownups only), first aid kit, etc. Shuttles: As far as shuttles go, we never encountered any personally. All transport seemed pretty loosey-goosey. No matter what you ordered, a dilapidated van always seemed to show up! Life jackets: One cruise we hoped to take in SJDS had to be missed since they didn’t have any life jackets for the girls. Our lake cruise in Granada did have them though (including a Spiderman one that the girls thought was VERY cool). So I’d say it is hit or miss and pack one if you can. Thanks for the congrats and have a wonderful trip! Let me know if there are any other questions I can help with. We are planning a trip to Central America with an 18 month old. I have a few questions. I know you mentioned requesting cars with seat belts but did you bring a car seat/booster seat with you? Or did you just buckle your kids in the seat belt? We too will arrange a lot of private cars in addition to a few buses. I can’t imagine lugging around a car seat given we’ll be backpacking but didn’t know if I should just omit it or what? Also, what about diapers? Did you buy diapers along the way? Are they easy to find? Our son will not be potty trained by then. And were you able to find milk for your kids to drink? Car seats would be very, very difficult (if not impossible) to find in Nica -it was hard enough finding cars with seat belts! FWIW, we always bring our own car seats when we travel. Yes, it is a pain to lug them around, but when we figure that we’ll likely be driving in many a jalopy over roads with harrowing accident rates, we always opt to bring them. I’m not sure if your itinerary would allow it, but in the past, we have had hotels store our car seats when we’ve had legs of a journey where they weren’t practical or necessary. And in Peru, we managed to hire a driver to take our car seats and unnecessary luggage from one town to the next so we could meet up with it later. So while I can’t say that my daughters have never been in foreign taxi sans car seats, overall we make a policy of using them and we’re always relieved to have them. As for diapers, my personal policy is to always bring them from home. 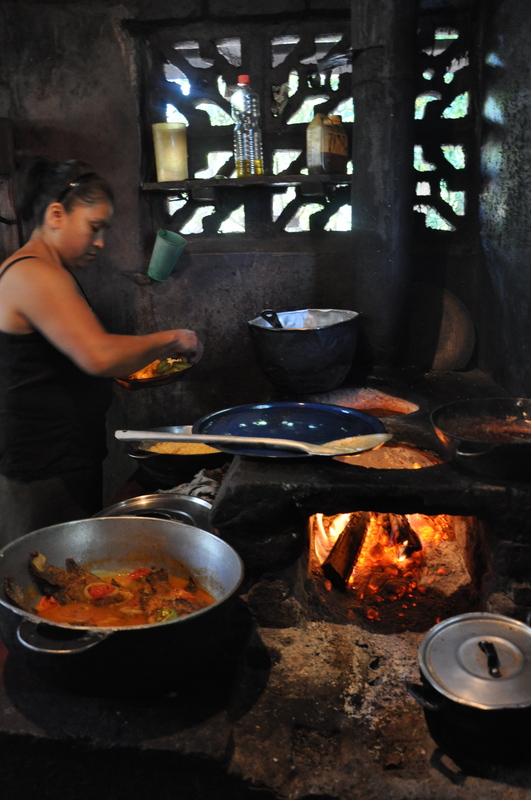 Yes, pañales, are available in even the tiniest village (since there are babies everywhere! ), but they may not be as sleek and modern as what you’re used to at home. And since laundry can’t always be done on a whim when traveling, I prefer to stick with diapers that I know will do the job reliably. Plus, the room you budget for diapers in your luggage can be readily replaced with souvenirs on the way home! That said, we did run out of diapers in Granada and the ones we bought were perfectly adequate. Even better, they were sold individually, so it was easy to purchase just the few we needed to get us through the last couple of days. Any pharmacy will have them. Milk will be available everywhere. You can find it in any grocery store, corner bodega, or restaurant. Same goes for flavored milk and yogurt drinks in individual serving sizes. We found the later very handy for tossing in our daypacks for snacks on the go. Also readily available: wonderful smoothies and fresh juices. You will find yourselves spoiled for choice! Hi! I stumbled onto your blog on the Lonely Planet website and it’s great! I think it’s cool that you and your family travel as much as you can. My husband, myself and our soon to be 5 year old daughter are headed to Nicaragua next Jan and Feb for about 6 weeks. I’ve been reading a few guidebooks and have kind of narrowed our trip to a couple of places…the San Juan Del Sur area and Big Corn Island. Although after reading your blog, we may swing by Granada for a few days. Question for you…we want to be near SJDS, but not right in the town. We like more off the beaten path places but plan to rent a house for about 3 weeks, so we want to be near a town for groceries, etc. Would you recommend Mango Rosa for a 3-4 week stay? Is there enough to do in that area or are you out in the sticks? Thanks for your help! Happy travels and congratulations on the new baby! Wow, lucky you for getting to do such a long stay in Nica! Totally jealous! Would I do a 3-4 week stay at Mango Rosa? Hmm… It would certainly be no hardship! The bungalows have kitchens, so you could cook in, plus have the option of hitting the restaurant from time to time. That said, my husband and I were marveling at how inexpensive and palatial many of the nearby rental houses were. For the money, you could probably rent a pretty cool house with housekeeping and a cook. But what Mango Rosa can offer is the help and guidance of the American/Canadian owners, which we found very useful. Mango Rosa is a good 20 minute drive on a dirt road out of SJDS, so it definitely has a real countryside feel, but isn’t so far out in the sticks if you need to go into town for supplies or adventure. Whether or not there is enough to do depends on what you like to do. Pretty much all of the fun is beach based, so if sunbathing, swimming, surfing, fishing, etc. will keep you content, then you’ll be very pleased there. We certainly didn’t get bored in the week we were there. But the general area is very sleepy. There are a few other guest houses and cafes in relative walking distance, but it is mostly farms and countryside. You would definitely want to have a car, since transport into town runs $15 each way. Hope that answers your questions. Happy to supply more info/advice, if necessary. Nice blog. I just sent your blog to a couple of friends who weren’t sure about going with kids. Thank you for the great and useful info. We are headed to Mango Rosa for a month in January! Thank you for giving me the reassurance of taking our daughter to Nicaragua. 🙂 Everyone we talk to says “You are going to Nicaragua? Isn’t it dangerous there?” We haven’t travelled internationally since our daughter was born and I’m excited for her to experience a different culture. Did you have your baby? Thanks again for your encouraging words.